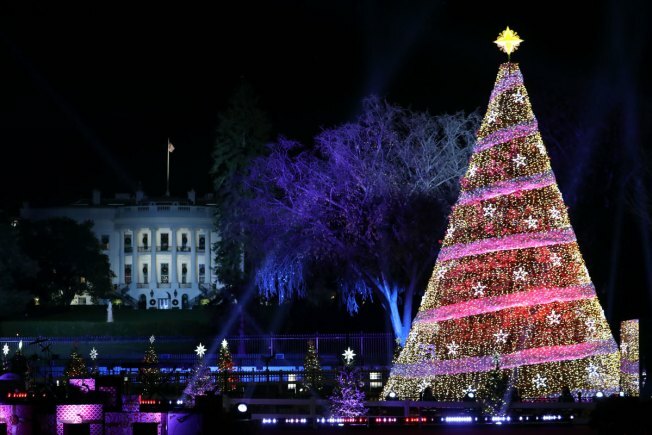 Sure, it's only October, but the lottery opens Friday for the 94th annual Christmas Tree Lighting celebration at the White House. James Taylor, Chance the Rapper, Kelly Clarkson and gospel singer Yolanda Adams will perform at the holiday party to light the National Christmas Tree on the White House Ellipse on Dec. 1. Free tickets will be awarded through an online lottery, which opened at 10 a.m. Friday and closes at 10 a.m. Monday. Winners will be notified Oct. 27. To enter the lottery, visit the National Christmas Tree Lighting website. If you can't get tickets to the show, you can still catch it on TV -- the Hallmark Channel will broadcast the lighting Dec. 2. Reese Witherspoon hosted last year's lighting ceremony, which also featured actress and singer Bellamy Young of ABC's "Scandal;" Crosby, Stills and Nash; Fall Out Boy; Trombone Shorty; Andra Day and Miss Piggy. The White House Christmas tree lighting has been a tradition dating back to 1923. President Calvin Coolidge was the first president to light a tree on the White House Ellipse, a 48-foot fir tree decked out with 2,500 electric bulbs. The tree switched to LED lights in 2007. And the tree itself has changed over the years. The tree that had been used as the National Christmas Tree since 1978 was felled by high winds in February 2011. Its replacement was planted a month later and lit for Christmas 2011, but died the following spring due to complications from transplant shock. The current tree, a Colorado blue spruce, was planted in fall 2012 and has been used for the lighting ever since.